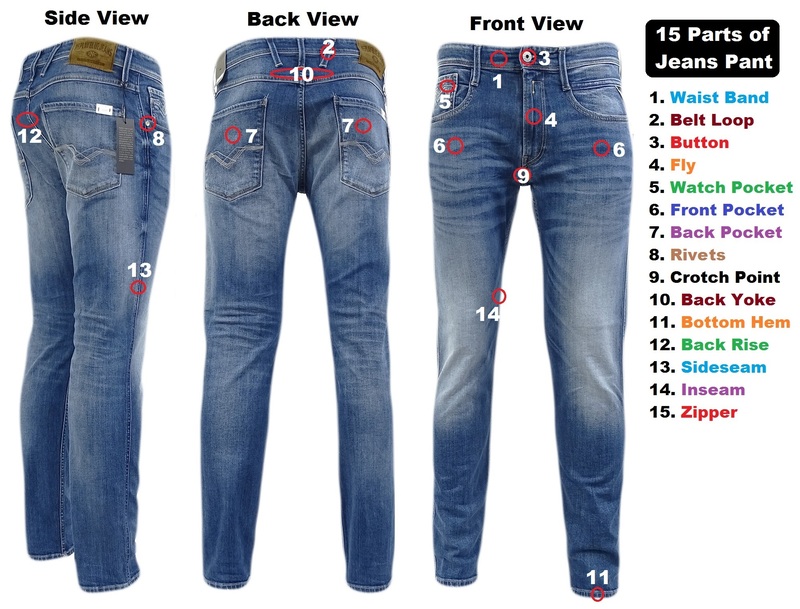 This article will help you to learn about jeans pant and answer the question of what are the different parts of jeans pant. Pant is one of the common forms of garments which ware by both male and female to cover waist to lower part of our body. Although jeans are one type of casual dress it is becoming more popular because of comfortability, affordability, durability, availability, and style. The consumption of jeans is increasing around the world. As the demand for jeans increasing in the Asian subcontinent, many industries already established in this region. Jeans pants are made from denim, a special type of fabric. World consumption of denim is for Jeans pant is much compared with other forms of dresses. So if you want to get into the market or you want to involve in jeans pant business then you must know the different parts of jeans pant. If you have detail knowledge of parts of pant, then it will be helpful for you to make stylish and comfortable jeans pant for man. The waistband is made from denim fabric which surrounds our waist when we wear jeans pant or any other pants. On this waistband, we basically wear a belt to fit properly. A jeans pant contains only 1 waistband on it. Belt loops are added with jeans pant so that belt can fix on it and hold the pant where we supposed to hold. There are five to seven loops are there in jeans pants. But most of the designer prefer five loops onto the waistband. The button is used to close the top of the fly of jeans pant. The fly is the opening part of the middle of the pant which is used to hide the zipper or button attached in there. 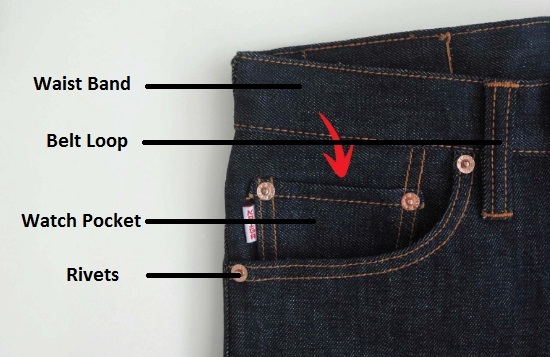 Watch pocket is the small pocket which places in the upper part of the front right pocket of jeans pants. Watch pocket is also known as a key holder which make the jeans pant more attractive. There is only 1 watch pocket for Jeans pant. In clothing, a pocket is mainly used for holding small materials but it also increases the attractiveness of cloth. A pocket is one of the main part of jeans pant where there are four pockets. Two-pocket are in front side and the other two are on the back side of the jeans pant. In a jeans pant, you may find rivets which are made of metal. Rivets actually used in the joining point of pockets of each side which not only holds the denim fabric together but also increase the attractiveness of that jeans pant. Crotch point is the joining point of two parts below the fly of jeans pant. In a jeans pant, you may find yoke which is located in the back side of the pant, attached with the waistband. Back yoke ensures the close fitting of jeans pant to our body. Bottom hem is in the bottom of jeans pant which is folded and attached by sewing. Back rise is the middle back joining point of jeans pant. Side seam and Inseam basically the part of jeans pant where two parts joint together by sewing. A zipper is used to close the front opening part of the jeans pant where both chain and button system can be used in jeans pant. Two buttons can be used instead of using a chain system zipper. There is not much difference between parts of jeans pant and parts of normal pant or trouser. You may find many similarities among parts of pants and jeans pant/trouser. 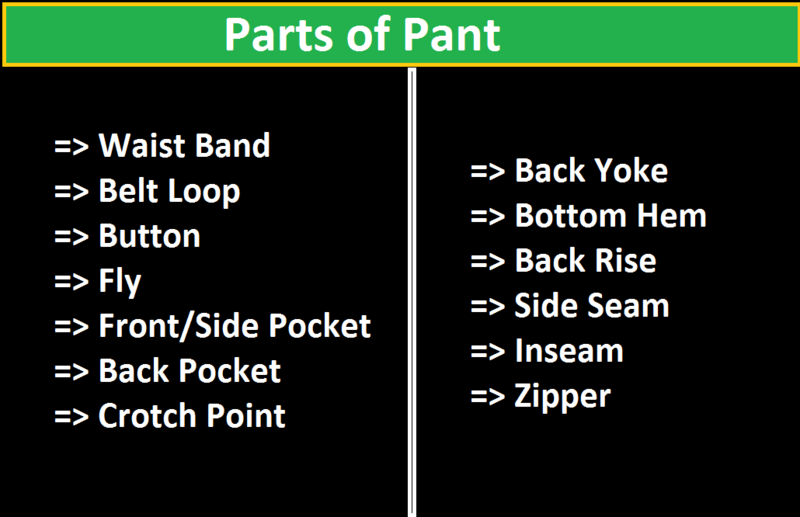 Here we list out 13 different parts of a basic pant. The main difference between jeans and normal pant is the fabric used for making. For jeans denim fabric is used and for pant normal fabric is used which is not categorized under the denim. Tagged 15 parts of jeans pant, all parts of jeans, all parts of jeans pant, Back Pocket of jeans pant, Back Rise of jeans, Back Yoke of jeans, Belt Loop of jeans, Bottom Hem of jeans, Button for jeans, common jeans pant parts, common parts of jeans pant, Crotch Point of jeans, different parts of denim pant, different parts of jeans pant, Different Parts of Pants, Fly of jeans, Front Pocket of jeans, Inseam of jeans, jeans pant for man, jeans pant parts, jeans pant picture, Jeans Rivets of jeans pant, List of Name of Jeans Pant, List of Parts of Jeans Pant, major parts of denim pant, Name of Different Parts of Jeans Pant, Pants Parts List, parts of a jeans pocket, parts of a pair of jeans, parts of basic pant, parts of jeans diagram, parts of jeans names, parts of jeans pant, parts of jeans pant name, parts of men's jeans, parts of normal pants, Parts of Pant, parts of pants, Sideseam of jeans, Waist Band of jeans, Watch Pocket of jeans, Zipper of jeans pant.